The nation’s favourite! A dish that was previously unknown in India has become one of the most requested dishes in Indian restaurants in the UK. Chicken Tikka Masala is frequently included in Top Tens of the nation’s favourite food and 20 million portions are said to be consumed in a year. Legend has it that it was created by a Bangladeshi chef when a British customer served with Chicken Tikka, asked where the gravy was. Whether that is an urban legend or not, it’s true that an Indian dish has been adapted to suit British tastes. Such is its popularity that it has even been exported to India and can now be found in restaurants in Bombay! There are as many different recipes for tikka masala as there are Indian chefs, so try ours then experiment till you find the taste you love. Mix all the marinade ingredients together and stir in the chicken. Make sure it’s all coated then leave to marinate for 1 hour or preferably overnight. Soak 6 bamboo skewers in water for 30 minutes (this stops them burning under the grill). Prepare the sauce. Heat the oil and add the garlic and chilli. Fry for 1 minute. Stir in the spices and fry for 1 minute. Add the tomatoes and puree and bring to the boil. Simmer gently for 15 minutes. Meanwhile thread the chicken pieces onto the skewers and grill for about 8 – 10 minutes until cooked. 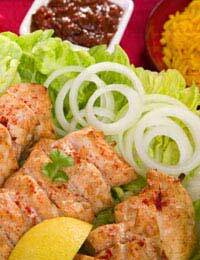 Take the meat off the skewers and mix it into the sauce along with the cream and a few chopped coriander leaves. Simmer for about 5 minutes then serve garnished with more coriander. One of the other Indian restaurant dishes, enjoyed especially by those who say they don’t like anything too hot or spicy, is Korma. In its homeland, a korma is a party dish that makes use of yogurt, nuts and expensive spices including saffron. Warm the cream and stir the saffron threads into it. Leave to stand for 2 hours.Mix the marinade ingredients together. Make deep cuts into the flesh of the chicken thighs and put them in the marinade, making sure they’re well-coated. Set aside, at room temperature, to marinate for 1 hour. Heat some oil in a frying pan. Add the cardamom, cinnamon and bay leaves. Toss them around in the hot oil. Scrape the excess marinade from the chicken pieces and fry, turning occasionally, until browned. Remove from the pan. Add the onions and fry until soft. Add the garlic and ginger and fry for a further minute. Return the chicken to the pan and stir in the remaining marinade, sultanas, coconut, salt and cayenne. Bring to the boil and simmer to reduce the sauce. Stir in the saffron cream, garam masala and ½ cup water. Cover and simmer for 5 minutes or until the chicken is thoroughly cooked. Remove the whole spices before serving, garnished with some chopped coriander.